Field service business owners are a dedicated group of people. They work incredibly hard to grow their businesses. They have to get scrappy and save at times to make sure that they can lead their operation through tough times. They know that they have to make tough decisions in order to build something that will last. I recently saw a great quote about entrepreneurs that rings true. "Entrepreneurs are the only people in the world that will work 80 hours a week, just to avoid a regular 40." This year when we ran our annual survey of hundreds of snow industry professionals, we saw a trend that stood out to us. In the past years when we asked the question what is the one thing that you want to change in your business, we received answers like improve our marketing infrastructure, go to more educational events and trade shows, etc. But this year, more business owners said that they wanted to improve their leadership skills. It is an interesting finding. We’ve written about leadership for field service professionals before. Here are a few of our blog posts on leadership. 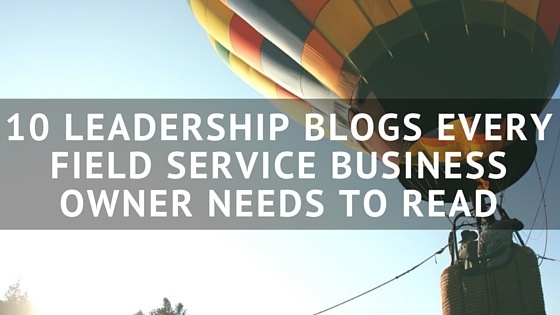 But we figured we would round-up some of the best leadership blogs on the internet. Here are ten blogs that you should bookmark if you want to improve your leadership skills! MichaelHyatt.com has a large subscriber base to their leadership blog. With over 615,000 subscribers, it is a great blog to read up on communication tips, leadership hacks and general management strategy. Bookmark this one and also listen to their podcast! The Harvard Business Review has a great section of their blog dedicated to leadership. And you know it has to be educational if it is coming from the east coast school! Unfortunately, they do have a limit of articles that you can read per month, but they are incredibly in depth and filled with information. Lead Change Group has a blog that is focused on only leadership topics. They span management categories and career development as well as self leadership tips. Their blog is updated frequently with new articles, so it would be worth it to bookmark this one and check it regularly! This blog has actually been around since 2006, so it is well established and has quite an extensive archive. One of their posts that I really enjoyed was called Balancing the 3 Boxes. It is a clever way to think about managing the past, future and present and how it relates to leadership. John Maxwell is a leadership coach who posts weekly on his blog. He has quite a few different topics that he writes on regarding leadership. He draws from years of experience and is an educator on the topic of leadership. Steve Farber’s blog is another resource from a business coach. Steve has written a couple books on leadership and is also an active speaker on the topic. Here is a great article on audacity and why it pays to be bold and to step outside of normal constraints. He also uses an example from Indiana Jones, so he receives bonus points in my book! If you like listening to podcasts, this is a site that you should bookmark. Besides having a great blog, they also have a podcast series which could be highly beneficial for field service business owners. They also have great resources on culture and diversity within businesses. Mr. Godin is an incredible writer! His posts are typically short form, quick thoughts on a topic. He publishes daily, so the best way to follow him is probably to sign up for his email notifications. Seth Godin is a very well reputed speaker as well, if you search for him on YouTube, you’ll be able to find some great talks he’s given, too. Not only does this site have an awesome URL, this blog is packed with valuable leadership resources. Another great name, but Leadership Freak has quite a few great posts. Similarly to Seth Godin’s blog posts, these articles are short reads. These would be great posts to read before you kick off the work day. They are motivational and applicable to field service professionals. Here's another bonus blog you should follow. Ours! Just click below to subscribe to our blog emails for a weekly dose of field service business tips straight to your inbox!